We all know that cloth mouse pad is a popular mouse pad product. It has most widely application and it is also the mainstream mouse pad product in the market. At present, cloth pad is the most widely used in the mouse pad. It is mainly divided into traditional cloth pad and coating cloth pad. 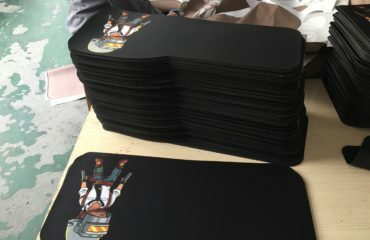 Ordinary cloth mouse pad is mainly made with extremely fine cloth attached to a piece of rubber, the back adopts herringbone pattern natural rubber to play a role of anti-slip. As it can print enterprise’s product pictures and contact information via thermal sublimation, it can get advertising effect. Silicone mouse pad is made from silicone material through physical process. First, it has all the characteristics of organic silicone material. Organic silicone has the performance of inorganic material and orgainic material with low surface tension, small viscosity coefficient, high compressibility, high gas permeability and other basic performance. It also has the excellent performance of high low temperature resistance, electrical insulation, oxidation stability resistance, weather fastness resistance, fire resistance, corrision resistance, tasteless, nontoxic, physiological inertia, etc. As the structure of organic silicone material is a little special, it has the ability of absorbing radiation. Silicone mouse pad is easier to clean with long working life. Silicone mouse pad is a mouse pad product specially designed for photoelectricity mouse. Plastic material mouse pad is normally the first choice for game players when select peripheral equipment. Too slip or too unsmooth mouse pad is not good for precise operation in the small range, so rapid movement and accurate braking becomes the opposite side for each other. At this time, plastic material mouse pad product is a good compromise choice. Plastic mouse pad product has the excellent performance in smoothness with very stable operation and high precision in positioning. Plastic mouse pad can be cleaned with water directly. The biggest drawback of plastic mouse pad is that it is not abrasion resistant. Glass and metal mouse pad is the earliest high-end game mouse pad. The feeling of these two kinds of material is very similar. One common feature is smoothness. Due to the its own material problem, glass and metal material mouse pad is almost extinct in the market. The disadvantage of glass and metal material is that it is easy to carry. Besides, these two kinds of mouse pad is relatively high. Normally, game players will buy.